Dancing (and a whole lot more) in the street! Have some free time this Saturday, August 1st? (August already? Where did the summer go?!) The Active Transportation Alliance, formally the Chicagoland Bicycle Federation, is holding a free, 8-mile “Open Streets” event stretching from Logan Square to Little Village. The event will run from 8:30 a.m. to 2 p.m. and feature a variety of activities, including music, art activities, children’s games, workout classes and much more. Even better: It’s a free event and there’s no registration, so you can join in at any point along the route! For more info, you can also call them at (312) 377-5727. Have you ever heard of Vauban, a small suburb in Germany? 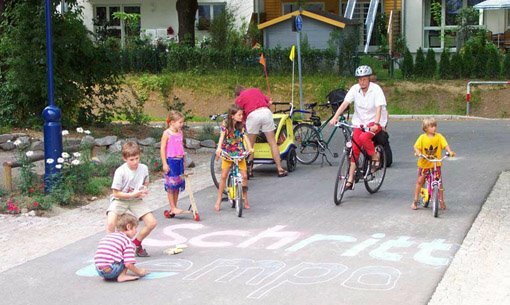 I hadn’t until recently, but after reading an article in yesterday’s New York Times—“In German Suburb, Life Goes On Without Cars”—I’m ready to pack my bags and hop on the next plane there. Vauban, completed in 2006, sits on the outskirts of Freiburg, near the French and Swiss borders. Street parking, driveways and home garages are generally forbidden, and Vauban’s streets are completely car-free, except for the main thoroughfare and a few streets on the outskirts of the suburb. The town is long and relatively narrow, so that the tram into Freiburg is an easy walk from every home. Stores, restaurants, banks and schools are more interspersed among homes than they are in a typical suburb. Most residents…have carts that they haul behind bicycles for shopping trips or children’s play dates. 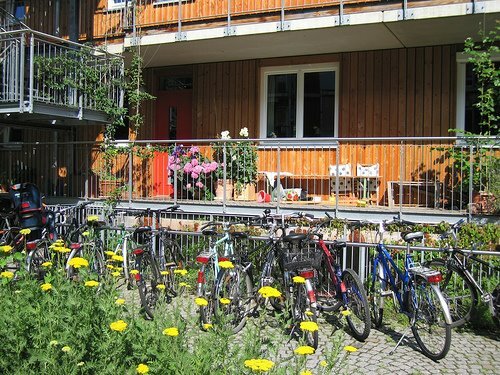 For trips to stores like IKEA or the ski slopes, families buy cars together or use communal cars rented out by Vauban’s car-sharing club. Moreover, parents in Vauban rave about the safety that goes along with having no cars on the streets. Children can run free without their parents fearing for their safety as they would if their kids were playing on a busy street corner. Check out this interesting slideshow of Vauban. Vauban is part of a growing suburban trend many are referring to as “smart planning.” In the U.S., the EPA is beginning to promote “car reduced” communities and experts expect public transport serving suburbs to play a much larger role in a new six-year federal transportation bill to be approved this year. Currently, most zoning laws in the U.S. still require two parking spaces per residential unit. Hopefully, Vauban’s success will lead to many more car-reduced cities and suburbs. 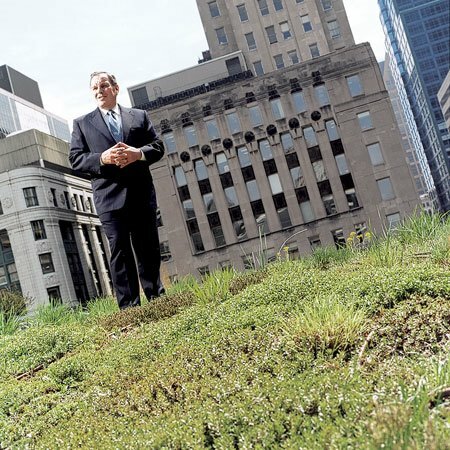 Mayor Daley nabs #5 spot on Grist’s "15 Green-Leaning Mayors"
The four mayors that topped Daley are: Michael Bloomberg (New York City), Greg Nickels (Seattle), Gavin Newsom (San Francisco), and Ed Malloy (Fairfield, Indiana). While the list is hardly complete, it does give a good indication of the vast geographical diversity in local climate leadership today. What do you think? Did Mayor Daley deserve the #5 spot? 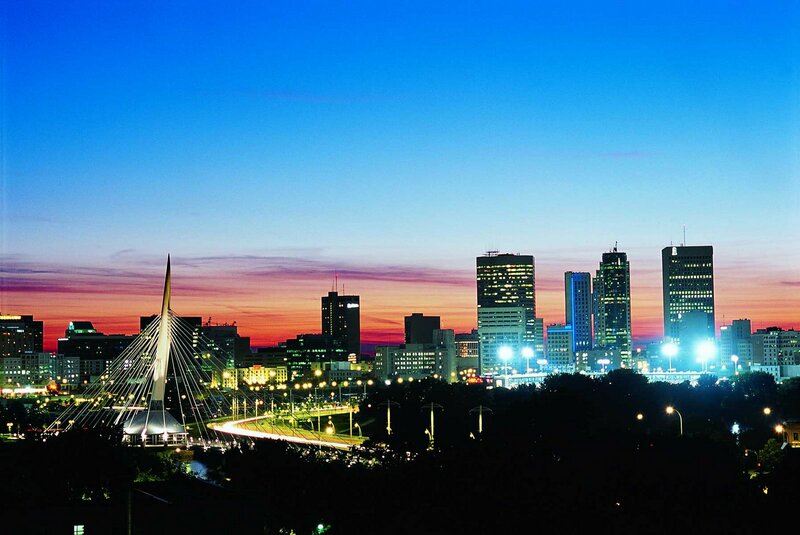 Car Sharing has become the key to success for a condo development currently under way in Winnipeg, Canada. In fact, the City of Winnipeg is insisting that Stonebridge Development Corp. Ltd. incorporate a car sharing program into the development, something that has never before been required in Winnipeg, and Stonebridge Development has agreed. Michael Robinson, a senior city planner, has said that if this car sharing proposal is successful, more will likely follow. Robinson also noted that the incorporation of car sharing programs into condo developments has already happened in Vancouver, Canada and Edinburgh, Scotland. It’s clear to see which side of the fence the city of Winnipeg falls on in regards to the growing debate on owning vs. sharing a vehicle! Hopefully, this will soon become the trend rather than an exception. I-GO Car Sharing is proud to be a part of the Center for Neighborhood Technology (CNT), which on Tuesday, April 28, was one of only eight organizations around the world to be selected for the 2009 MacArthur Award for Creative & Effective Institutions. It was CNT—one of the country’s most venerable and innovative think tanks committed to urban sustainability issues—that originally launched I-GO Car Sharing in 2002. 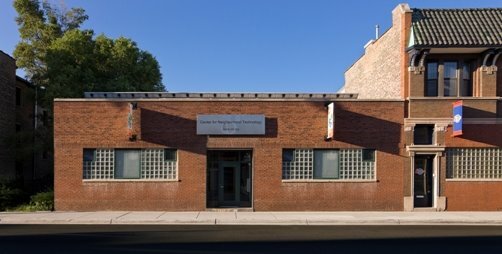 We remain closely attached to them to this day—both in terms of mission and literally: I-GO’s HQ is housed in the same LEED-certified-platinum office building in Wicker Park. The accolades weren’t just from the MacArthur Foundation. We encourage everyone to read up on this remarkable, prescient organization that has been waaaaay ahead of the green curve since its founding three decades ago. Reinventing a “smart energy grid” for the nation may be the green topic du jour now. But CNT has been talking smart grid long before the greenwashing bandwagon hoppers grabbed ahold of those coattails. CNT Energy’s Power Smart Pricing helps residential consumers cut energy costs and reduce their peak energy use through hourly price signals. The plan was adopted by ComEd and other electricity providers in the Midwest. The Energy Savers program offers a one-stop shop for energy audits and loans to finance improvements that substantially reduce natural gas and electricity use in multifamily buildings. Reductions in energy consumption lower the operating costs of rental properties, keeping them affordable for the long term. No doubt they’ll keep innovating for another 30 years and beyond. You’ve heard of car sharing but have you heard of bike sharing? There are already successful bike sharing programs in Paris, Barcelona, London, Stockholm, Milan, Berlin, Munich, Vienna & Copenhagen- to name just a few. 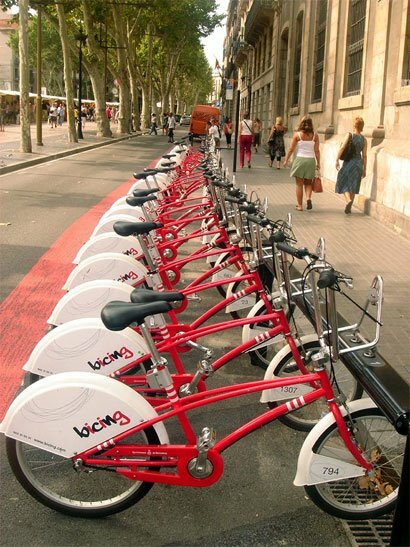 Hopefully it is only a matter of time before bike sharing starts spreading throughout the U.S. as well! Below you can listen to a very interesting interview on last Friday’s Brian Lehrer Show. Paul Steely White, Executive Director of Transportation Alternatives, discusses the possibility of introducing a bike sharing program in New York City. Would you utilize a bike sharing service in Chicago? If not, why not? What would need to change in order to get you biking? The Greater Auburn Gresham Development Corporation, in association with Alderman Latasha Thomas (17th Ward), and the Winneconna Lakes Improvement Association are hosting their 2nd Annual Earth Day Event to raise environmental awareness. I-GO reps will be there to demonstrate economical and environmental transportation alternatives. The Sustainability Council of the U of C is providing an opportunity for students and faculty to become acquainted with local business, organizations and other groups in Chicago. I-GO will be there spreading the good word. I-GO does not need any volunteer help for this event, but we’d love to see you if you’re in the area. Loyola University Chicago and the communities of Andersonville, Edgewater, Ravenswood, Rogers Park, Uptown and West Ridge are hosting the 2nd North Lake Shore Earth day celebration. I-GO has been invited to help inform community members about global and local environmental issues such as clean air and energy alternatives, as well as practical, everday ways to green one’s home and business. I-GO is looking for a few volunteers to help staff this event. If you’d like to help out, please send Lauren an e-mail at lauren@igocars.org. Have you heard about composting with worms (vermicomposting) before but been afraid to give it a try? Worried about making a mess or just not liking the idea of worms in your house? Or would your kids love to learn all that worms can do to green your household? We’ve got the workshop just for you! Urban Worm Girl, who just happens to be a ChiTown Rewards Member, is hosting a “Worm Composting Workshop” in Lincoln Park on Saturday April 4th from 1 – 2 p.m. Don’t miss this special, hands-on opportunity to learn all about the process of composting with worms. You will also have the opportunity to buy supplies and set up your bin on-site: your worms will be ready to start working when you leave! Come out and learn how to keep composting in the home easy, clean and fun for all. Call (312) 399-4725 or email Stephanie to reserve your spot today! 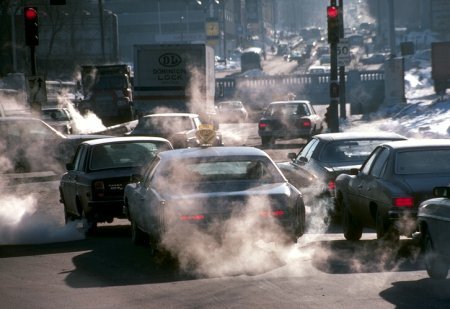 The Environmental Protection Agency (EPA) is currently considering reversing a Bush administration decision which prevented California (along with 13 other states) from enacting stricter air-pollution standards for motor vehicles. This is great news, not only because of the positive environmental effects the stricter rules would bring about, but simply because it might actually happen! California has been leading the fight to enact these stricter CO2 regulations for years now and has seen little help from the federal government. However, that was under the Bush administration. Things seem to be changing since Obama took office. The 13 other states joining California in this fight are: Arizona, Connecticut, Maine, Maryland, Massachusetts, New Jersey, New Mexico, New York, Oregon, Pennsylvania, Rhode Island, Vermont and Washington. Help make this happen – sign the petition urging the EPA to grant the waiver! The public likes public transportation! Americans took 10.7 billion trips on public transportation in 2008! This is a 4% increase over 2007 levels and also marks the highest level of ridership in 52 years, according to a report released by the American Public Transportation Association (APTA). Ridership on all modes of public transportation increased in every quarter for the second year in a row. Light rail had the highest increase in annual ridership, growing by 8.3% in 2008, followed by commuter rail (4.7%), bus service (3.9%) and heavy rail (3.5%). 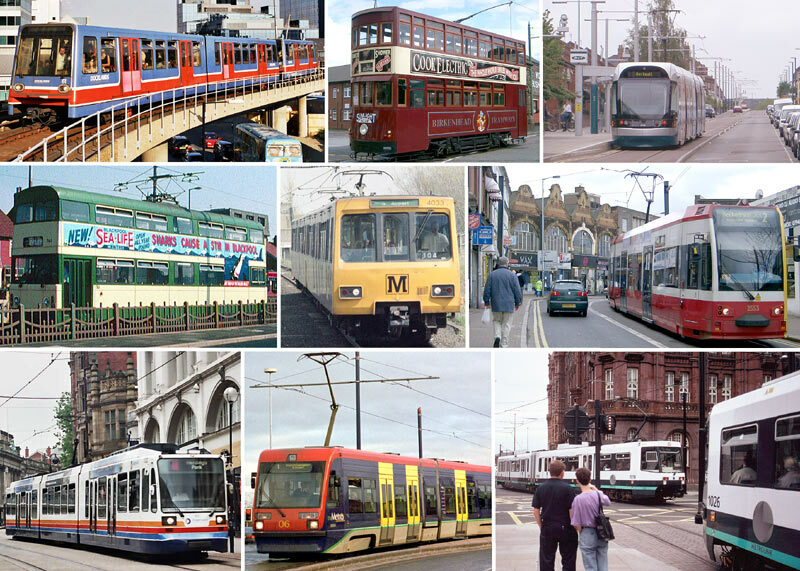 Streetcars and trolleys are considered ‘light rail’, while subways are categorized as ‘heavily rail’. Not only are more people taking public transportation, they are also driving less: Total vehicle miles traveled in the U.S. declined by 3.6% from 2007 levels. According to the APTA report, “This ridership record continues a long-term trend of ridership growth. Public transportation use is up 38% since 1995, a figure that is almost triple the growth rate of the population”. Not too shabby, huh?